Professionals today, whether they are new or seasoned, need a solid foundation of essential skills in order to keep pace with the speed of change. The American Management Association, the preeminent provider of business education worldwide, trains the majority of the Fortune 500 companies in competitive business skills. Now, for the first time, AMA has assembled the most critical, "must-have" skills for managers and leaders in one handy volume. "Boot camp," as even those of us who have not been in the military know, refers to the basic training period during which new recruits get their first taste of the discipline and hardship endured by soldiers. It is not by accident that American Management Association President and CEO Edward T. Reilly chose to call the association’s book AMA Business Boot Camp. Anyone who has been thrust from an operational to a management position can relate to the new recruits’ experience of finding that everything has changed around them. New knowledge, new strategies and a new mindset are all required for a first-time manager to be successful. Reilly’s goal is to help these new leaders and managers navigate the brave new world in which they find themselves. The book covers everything from hiring and coaching to project management and strategic thinking. The additional focus on the basic roles of the manager and a detailed strategic frame of reference make AMA Business Boot Camp a comprehensive management manual. 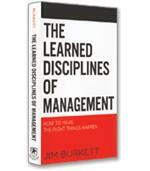 It distills a vast number of ideas into six clearly written and well-organized chapters. The opening chapter, titled "Basic Management" is intended to help new managers and leaders transition into their new positions. It is typical in its scope and clarity of the rest of the book. Readers immediately learn the eight primary roles of a manager: leader, director, contributor, coach, facilitator, observer, innovator and organizer. They learn the characteristics of a healthy workplace, how to run meetings and the keys to effective communication. As part of this latter topic, Reilly includes a simple horizontal flow chart with six components that effectively highlight why communication often fails. A sender always encodes a message with his or her "individual experience, value, attitudes, language and so on," Reilly explains. "The receiver hears the message and, from his own perspective, (i.e., using his experience, values, attitudes, and language) interprets the message." While this communication process may seem obvious, in truth many leaders forget the "encoding" and "decoding" components of communication. This type of insight behind the book’s straightforward explanations and supporting lists is evident throughout the text. Perhaps the best way to use this book is to read it once, then keep it nearby for consultation whenever a difficult decision or unexpected results present themselves. 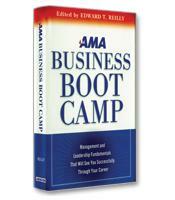 AMA Business Boot Camp is, of course, much more than lists and how-to tips. For example, in a chapter on strategic thinking, Reilly offers a strategic frame of reference to help new leaders handle continuous and often conflicting dualities, such as short- and long-term challenges, systems and people, and innovation and imitation. Illustrated in the form of a pyramid, the frame of reference clearly shows that relationships are the foundation that supports all the other elements of strategy — vision, mission, goals, objectives, strategies, tactics and roles. AMA Business Boot Camp is for all leaders, not just new leaders. 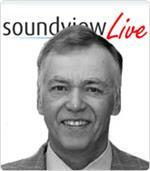 Even the most experienced veteran of the corner office can benefit from a review of the basics. There are few single-volume guides that are more effective at providing a needed refresher than this one.